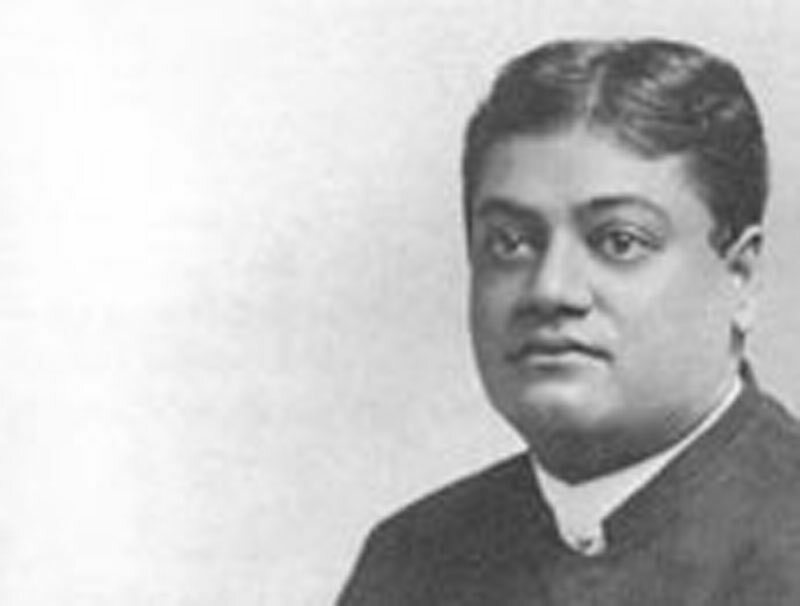 The Story of Prahbalada - Swami Vivekananda - Frank Parlato Jr.
Hiranyakashipu was the king of the Daityas. The Daityas, though born of the same parentage as the Devas or gods, were always, at war with the latter. The Daityas had no part in the oblations and offerings of mankind, or in the government of the world and its guidance. But sometimes they waxed strong and drove all the Devas from the heaven, and seized the throne of the gods and ruled for a time. Then the Devas prayed to Vishnu, the Omnipresent Lord of the universe, and He helped them out of their difficulty. The Daityas were driven out, and once more the gods reigned. Hiranyakashipu, king of the Daityas, in his turn, succeeded in conquering his cousins, the Devas, and seated himself on the throne of the heavens and ruled the three worlds — the middle world, inhabited by men and animals; the heavens, inhabited by gods and godlike beings; and the nether world, inhabited by the Daityas. Now, Hiranyakashipu declared himself to be the God of the whole universe and proclaimed that there was no other God but himself, and strictly enjoined that the Omnipotent Vishnu should have no worship offered to Him anywhere; and that all the worship should henceforth be given to himself only. Hiranyakashipu had a son called Prahlâda. Now, it so happened, that this Prahlada from his infancy was devoted to God. He showed indications of this as a child; and the king of the Daityas, fearing that the evil he wanted to drive away from the world would crop up in his own family, made over his son to two teachers called Shanda and Amarka, who were very stern disciplinarians, with strict injunctions that Prahlada was never to hear even the name of Vishnu mentioned. The teachers took the prince to their home, and there he was put to study with the other children of his age. But the little Prahlada, instead of learning from his books, devoted all the time in teaching the other boys how to worship Vishnu. When the teachers found it out, they were frightened, for the fear of the mighty king Hiranyakashipu was upon them, and they tried their best to dissuade the child from such teachings. But Prahlada could no more stop his teaching and worshipping Vishnu than he could stop breathing. To clear themselves, the teachers told the terrible fact to the king, that his son was not only worshipping Vishnu himself, but also spoiling all the other children by teaching them to worship Vishnu. The monarch became very much enraged when he heard this and called the boy to his presence. He tried by gentle persuasions to dissuade Prahlada from the worship of Vishnu and taught him that he, the king, was the only God to worship. But it was to no purpose. The child declared, again and again, that the Omnipresent Vishnu, Lord of the universe, was the only Being to be worshipped — for even he, the king, held his throne only so long as it pleased Vishnu. The rage of the king knew no bounds, and he ordered the boy to be immediately killed. So the Daityas struck him with pointed weapons; but Prahlad's mind was so intent upon Vishnu that he felt no pain from them. At last, the king ordered the boy to be tied with mighty serpents called up from the nether worlds, and then cast to the bottom of the ocean, where huge mountains were to be piled high upon him, so that in course of time, if not immediately, he might die; and he ordered him to be left in this plight. Even though treated in this manner, the boy continued to pray to his beloved Vishnu: "Salutation to Thee, Lord of the universe. Thou beautiful Vishnu!" Thus thinking and meditating on Vishnu, he began to feel that Vishnu was near him, nay, that He was in his own soul, until he began to feel that he was Vishnu, and that he was everything and everywhere. When his father came to hear about it, he again became furious with rage, and calling the boy to him, threatened to kill him, and abused Vishnu in the worst language. But Prahlada still insisted that Vishnu was the Lord of the universe, the Beginningless, the Endless, the Omnipotent and the Omnipresent, and as such, he alone was to be worshipped. The king roared with anger and said: "Thou evil one, if thy Vishnu is God omnipresent, why doth he not reside in that pillar yonder?" Prahlada humbly submitted that He did do so. "If so," cried the king, "let him defend thee; I will kill thee with this sword." Thus saying the king rushed at him with sword in hand, and dealt a terrible blow at the pillar. 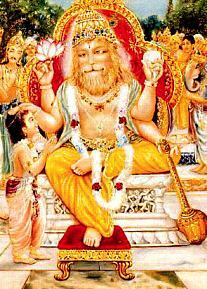 Instantly thundering voice was heard, and lo and behold, there issued forth from the pillar Vishnu in His awful Nrisimha form — half-lion, half-man! Panic-stricken, the Daityas ran away in all directions; but Hiranyakashipu fought with him long and desperately, till he was finally overpowered and killed. Then the gods descended from heaven and offered hymns to Vishnu, and Prahlada also fell at His feet and broke forth into exquisite hymns of praise and devotion. And he heard the Voice of God saying, "Ask, Prahlada ask for anything thou desires"; thou art My favourite child; therefore ask for anything thou mayest wish." And Prahlada choked with feelings replied, "Lord, I have seen Thee. What else can I want? Do thou not tempt me with earthly or heavenly boons." Again the Voice said: "Yet ask something, my son." And then Prahlada replied, "That intense love, O Lord, which the ignorant bear to worldly things, may I have the same love for Thee; may I have the same intensity of love for Thee, but only for love's sake!"